ArenaNet honors her as a special Guild Wars 2 NPC. Has a videogame ever inspired you to do something in real life? I remember that GTA: San Andreas made me try to work out more often after making protagonist CJ hit the gym in-game, but that's about it. A woman by the name of Kelly "Ameranth" Wells, however, found in ArenaNet's Guild Wars the inspiration to walk across the United States from coast to coast accompanied only by her faithful canine friend, Anna. And so my straightforward coast-to-coast walk got a little less straightforward and a lot more fun. Now instead of just walking along, I'm approaching the whole thing as if it were a game. Specifically, an MMORPG (massively multiplayer online role-playing game). I've made up a brief character sheet for the players - namely myself and Anna - and I hope to complete quests (for example: various sights I hope to see) and unlock achievements (for example: each new state I walk into) along the way. I mean, I've been playing Guild Wars for six years now - I think that's the longest I've ever done any one thing. It was bound to rub off on me in some way. I'm impressionable like that. On her way from Maine to California, Wells ended up walking into the offices of ArenaNet, which had learned of her mission. Guild Wars 2 designer Linsey Murdock called Wells' journey one of the "coolest things I have ever heard of! Ever!" It was one thing to get a tattoo inspired by a favorite game, said Murdock, but it was another to "take an epic journey across the country on foot with your trusty animal companion[.] That's magical." ArenaNet has since immortalized Wells in one of the most appropriate (and suitably awesome) ways ever - with her own Guild Wars 2 NPC. 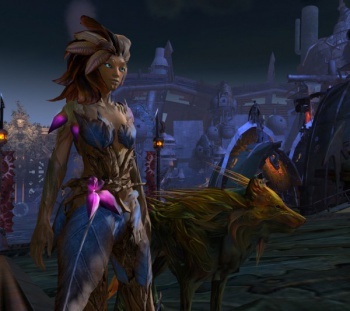 Ameranth (Wells' online handle) is one of GW2's sylvari plant people. Unlike the others of her kind, however, Ameranth can be found wandering around the world far from her home tree, accompanied by her faithful sylvan hound companion Anna. Maybe "Anna" isn't the most creative name for a plant-dog-thing in a fantasy world, sure, but it's hard to deny how awesome it is that she - and her owner - are now in it.